the pink toque. 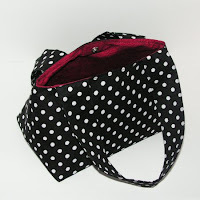 a craft blog: What's New?! I am ashamed to say that it's been so long since I've posted anything crafty. Since getting back from my trip to the states to visit family and friends, I've started working a real job and so I've not found as much free time to craft as before. That doesn't mean I haven't been creative, though! For more on the other non-crafty things going on in my life right now, check out Lucas and I's personal blog: Look At Us Go! 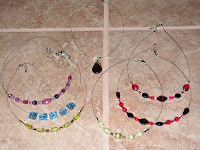 While in Indiana I learned how to make beaded necklaces, and my mom and I made several together. They're fairly simple - just some bead wire with the clamshell clasps and a variety of beads found at various crafty shops. I've got some beads that I picked up while in Indiana that are in desperate need of being turned into a new necklace creation, but I just haven't taken the time to do so. Thanks to a little help on the kfb, or knit front to back, from the kind people at Make One Yarn Studio (a suggestion from Claire, thanks!) 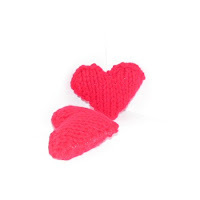 I was able to complete the mini heart knitting pattern I've been trying to do forever. Since figuring the pattern out, I've made several little plush knitted hearts to hide in various places for Lucas to find. They're so soft and cute! I'd love to make a whole army of them someday. I tried my hand at felting for the first time, but it really didn't turn out so great. I think it's because I tried to felt by hand with hot soapy water instead of using the washing machine, so next time I'm doing a load of laundry I'll see if my felting turns out any better using that method instead. I just couldn't justify doing a whole load of laundry just to felt a couple tiny hearts. We'll see! That's really about it in the past several weeks. The Indiana trip and the new full time job has kept me pretty busy, though I've started up a new little stuffie project that I can't wait to finish and share -- it's currently a secret, though! Look for it soon :) Happy crafting!